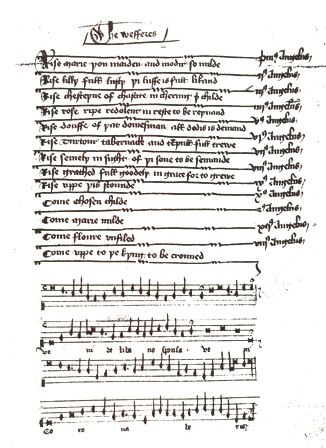 Written music to accompany the scripts of medieval performances is rare. The famous Coventry Lullaby from the Coventry Mystery Plays is an unusual example. Below is reproduced page 17 of Eileen White's 1984 book The York Mystery Play, (pub. Yorkshire Architectural and York Archaeological Society). It shows the two-part setting of 'Veni de Libano Sponsa' on folio 233. Whereas modern theatre music is concerned with reflecting and establishing the emotion of a scene, medieval music has a greater symbolic value. It characterises heavenly characters with dignity by means of high, pure, vocal tones and open harmonies. The infernal regions and diabolical characters are shown by wild, discordant sounds. Human characters are between these two - good people closer to heavenly music. So the harp, with its associations with King David, has a higher status than (say) the bagpipes, the characteristic instrument of the shepherds. The National Centre for Early Music has a library of music. The librarian can be contacted on librarian@ncem.co.uk. Modern research into the plays continues. 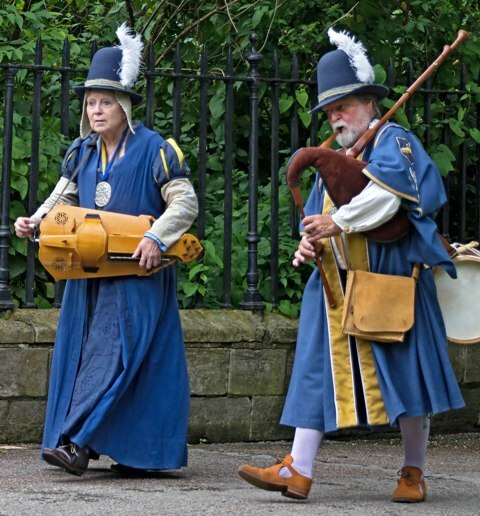 For instance Dr Mariana Lopez, when a student at the University of York's Department of Theatre, Film and Television undertook research into how the Plays might have sounded in York's medieval streets, using 'virtual acoustics'. Here is a photograph of the Leeds Waits accompanying the 2014 Mystery Plays, with a hurdy gurdy and bagpipes: York Waits were not the only musicians accompanying the wagons. For more information about Musical Director Paul Toy's arrangements, see this page.